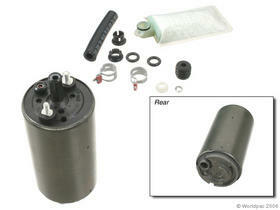 Replace your broken, worn out parts with this quality Denso fuel pump. Perfectly replaces the original pump and is guaranteed to fit without modification. DENSO guarantees the quality of the products they produce because every component that leaves their factories has been designed with precision, manufactured to the strictest OE standards and subjected to rigorous safety and performance tests. In the end, it all comes down to quality -- that's what the DENSO name stands for. This pump is the perfect performance upgrade when adding boost or supercharging any your engine. The DENSO supra pump flows at a rate of 280 gpm and has enough power to keep up with even the most demanding forced induction setup. Pump may fit other makes and models with slight modification. Due to the increase in fuel pressure KSD Engineering cannot guarantee fuel mileage.